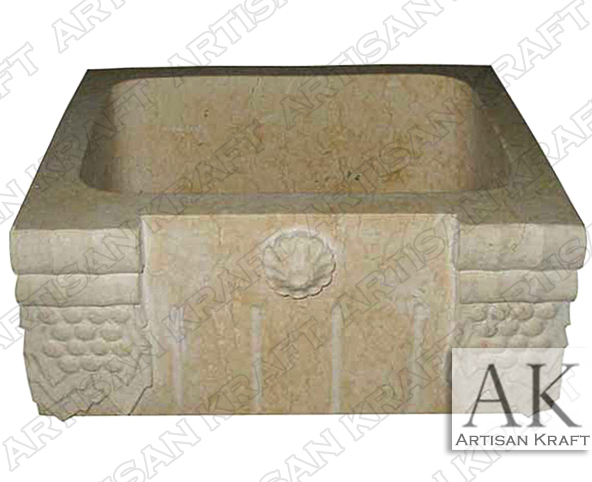 Beige marble farmhouse sink carved from beige marble. A great addition to any homes kitchen. It can be made larger to serve as the main kitchen sink. At its current size it works great as a side kitchen counter. It is finished all around thus can be installed as a vanity sink. It can be made without the decorative carvings of the shell and the grape vines. A smooth non-carved design would make this a great modern sink. Travertine kitchen sinks are also available. Choose from a large variety of natural stones such as limestone, marble and travertine. Natural stone sinks are the great addition to a beautiful kitchen. Also, take a look at our marble fireplace selection and our kitchen hoods. NC stone sinks and OH farmsink TN.